Ty's sacrilegious advert for his "Magi-Complex™" panacea. Ty Bollinger in heaven ?, that has to be CGI , as he's destined for the other place. Ty Bollinger is an American conspiracy theorist, promoter of alternative cancer therapies, a critic of evidence-based medicine, an anti-vaccinationist, germ theory denialist and statin denialist. He operates the TheTruthAboutCancer website. If his 2013 "Monumental Myths" book is an accurate account of his views, then Ty Bollinger is a super-conspiracy-theorist. His main field of interest is cancer. His books on that subject have been recommended by quacks such as Jeff Rense, Rashid Buttar, and Mike Adams. His most recent (2014) production on the-big-C is a straight-to-DVD movie called “the truth about cancer”, which includes such luminaries as Dr Joseph Mercola, Dr Stanislaw Burzynski, Dr Tullio Simoncini, Dr Bradford S. Weeks, Dr Ben(nie Stephen) Johnson, Dr Roby Mitchell, Dr James Forsythe, Dr Gaston Cornu-Labat, Dr Antonio Jimenez, Dr Jonathan V. Wright, Dr Josh Axe, Dr Murray Susser, Dr Nicholas Gonzalez, Dr Darrell Wolfe, Dr Daniel Nuzum, Dr Keith Scott-Mumby, Dr Joel D. Wallach, Dr Leonard Coldwell, Chris "beat cancer" Wark, and Laura "Mum's not having chemo" Bond. Ty Bollinger has been involved in two MLM schemes where he has recruited others to sell natural health products : Moringa-magic and BX Protocol. Ty proclaims at every possible opportunity that he is raving Christian. He has managed to combine his love for Jeezus with his love of peddling natural health products by selling the “Magi-Complex™”. It's not Freudian thing: it's a mixture of frankincense, myrrh, & turmeric (the latter is gold-colored, that's close enough). The “Magi-Complex™” cure-all is marketed by a company registered in his name called "Epigenetic Labs llc". Ty Bollinger's right-hand-man is Jonathan Hunsaker: the "EpigeneticLabsLLC.com" website is registered in the name "Jonathan Hunsaker", as are other interestingly named websites, (which are not necessarily all created by the same guy). In 2017 "Epigenetic Labs" changed its name to "Organixx", their nutritional supplements are formulated by Daniel "Doc" Nuzum. Ty has business interests other than alternative medicine: he has a company called "Bollinger Financial", which advises people where they should invest their money. The "Bollinger Financial" website was parked in October 2016, 2017 it's gone. In October 2017 the Ty Bollinger "live" medicine show took place in God's waiting room , (Ty knows his market). Tickets were $499 & $999: the expensive ticket got you a seat so close to the stage you can smell the snake-oil . "Cancer - Step Outside the Box" is Ty's first book on cancer (out of his box more like). The foreword is by Webster Kehr, and the artwork is by David Dees. Transcript of "The Truth About Cancer: A global quest" 2015 docu-series, provided by Ty Bollinger , (287pages 8Mb pdf file). Become an "affiliate" of Ty Bollinger and make "a ton of money" : 40%-50% commission. The Better Business Bureau have received 13 complaints about Ty's company "Epigenetic Labs llc". An unlisted YouTube video of Ty selling "Epigentic labs" brand dietary supplements. A 2011 book on herbal-medicine edited by Ty Bollinger, written by Dr Michael Farley ND. Ty claims he cured his own skin-cancer in 2008, and will tell you how for $19-95. co-authored by Ty Bollinger and Robert Scott Bell. http://medicaldreamteam.com/ ... a 2012 book about natural medical treatments edited by Ty. http://losmejorestratamientocancer.com/ ... the Spanish-speaking world is not spared. http://www.1611kingjamesbible.com/ ... You've got the book, now buy the DVD. http://bollingerfinancial.net ... since November 2016 Ty's financial website is unreachable. Other websites registered in the name "Ty Bollinger", (not necessarily the same person). Ty's "Truth about Cancer" YouTube channel. Ty Bollinger appears in a 2014 video about Satanic conspiracies. Vimeo video where Ty encourages viewers to join a private-association to learn the suppressed "truth" about health-care products he sells. 2017 Ty promotes WaveRider : a $1780 $997 anti-EMF device invented by a "Dr Igor Smirnov", who also makes a device to structure water. A YouTube of Ty Bollinger interviewing Dr Igor Smirnov about his WaveRider invention. Water memory gets a mention. Ty & Dr Smirnov again, this time flogging a plastic placebo button that sticks on your phone, also available as talisman pendant. Yet another example of Badger's Law from Ty : this time it's "the truth about detox". April 2017 another "The Truth about" docu-series from Ty Bollinger, this time it's vaccines. David Gorski's article on Ty Bollinger's promotion of ineffective cancer treatments. ↑ Ty says vaccines are “cancer in a syringe”. ↑ The Truth About Cholesterol, Statin Drugs, and Cancer. Ty Bollinger. ↑ Ty's comprehensive collection of conspiracy theories. ↑ If Ty Bollinger is just acting paranoid, he deserves an Oscar. ↑ Ty quotes Jeff Rense. ↑ Ty quotes Dr Rashid Buttar. ↑ Ty quotes Mike “Health Ranger” Adams. ↑ Science-Based-Medicine's review of the movie. ↑ HatePseudoscience's review of the movie. ↑ Credits on trailer for Ty's 2014 movie "The truth about cancer". ↑ List of “experts” in “The Truth about cancer” movie, with links to their websites. ↑ Dr Weeks's medical license suspended in 2013: "a danger to the public". ↑ Dr Bennie Stephen Johnson is a co-defendant with Robert O. Young. ↑ Udderly disgraceful behaviour by Roby Mitchell in 2012. ↑ Dr Wright's medical license suspended in 2013 for "unprofessional conduct". ↑ Dr Murray Susser, G22316, found guilty of gross negligence & incompetence. ↑ Medical license suspended for three years for negligence & incompetence. ↑ Dr Wolfe is billed as an Acupuncturist and a "medical intuitive"
↑ Indicted for practicing medicine without a license in Ohio in 2005. ↑ The qualifications of "Professor Keith Scott-Mumby MB ChB, MD, PhD, FRCP (MA)" explored here. ↑ Dr Wallach is a veterinarian and naturopath who has used Laetrile & chelation on human customers. ↑ Unlisted YouTube of Ty pushing the "Zija Moringa" stuff. ↑ Leaked data from Delta Institute who make BX Protocol. 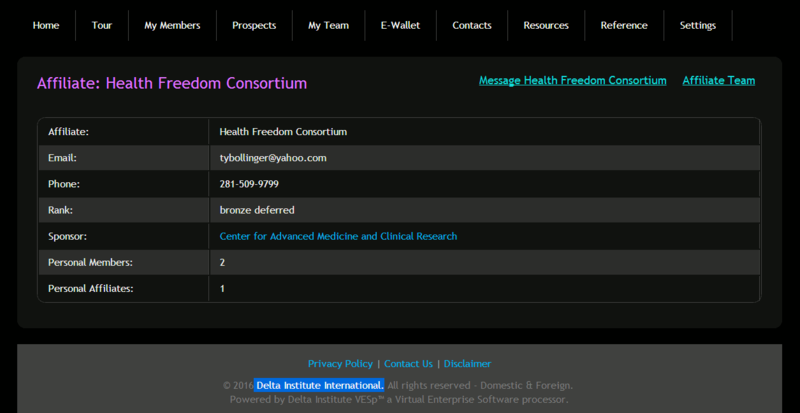 ↑ A list of BX Protocol agents, Ty = "Health Freedom Consortium". ↑ “Magi-Complex™” label with "quack Miranda warning". ↑ Photo of Ty Bollinger (left) & Jonathan Hunsaker (right). ↑ Websites registered in the name "Jonathan Hunsaker". ↑ YouTube: "Dr.Daniel Nuzum, Organixx Lead Formulator". ↑ YouTube: "Daniel 'Doc' Nuzum of Organixx exposed". ↑ Most recent archive copy of "www.bollingerfinancial.net"
↑ 2017 The URL "www.bollingerfinancial.net" is for sale. ↑ Millions of dollars are generated from broadcasts of the "Live" TTAC event. ↑ or is the odor bovine-excrement ?. This page was last modified on 23 March 2019, at 23:10.